What follows is an outline of the content and best practices reviewed during the second stop of your Localist Implementation: a Platform Tour. 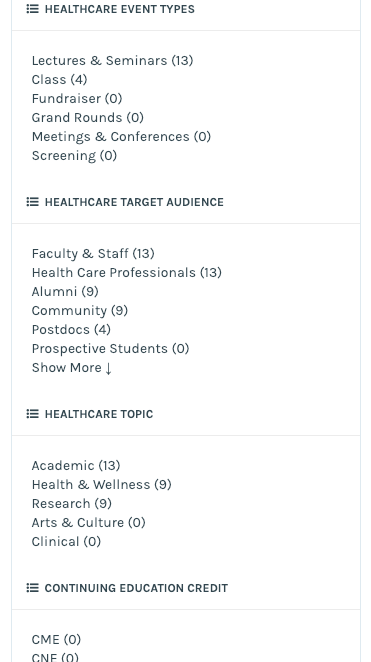 Setting up your Classifications is the first step in implementing Localist, and they’re all connected in providing users with context surrounding your events. These create a directory in your calendar that allows Users to search via a particular Place, Group, or Department. Place Pages – every event is hosted somewhere, so these landing pages provide users with context around where events will be hosted. On this page, you’ll add an address for a location once. When you add an event, you’ll start typing the name of the Place Page and select it from the dropdown that appears. When a Place Page is assigned to an event, it will link it to a map for this location. 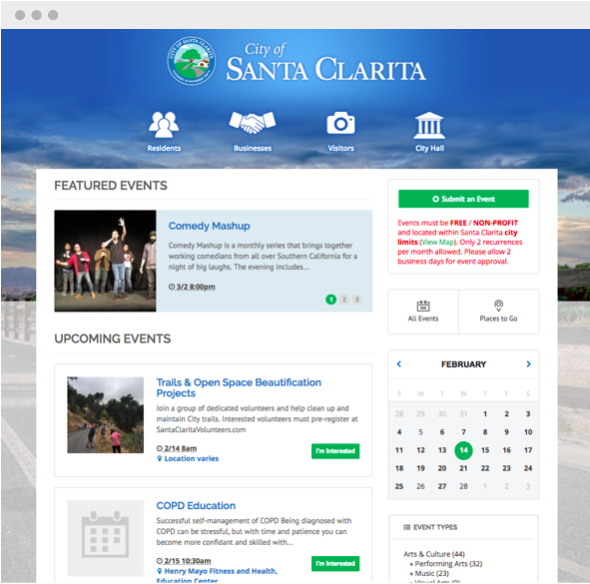 Group and Department Pages – give events hosted by Student Groups, Academic Departments, Partners, etc. a place to live on your platform. Similar in structure to Places, Groups & Departments will also display all context such as descriptions, website URLs, and a photo. Functionally, Groups and Departments are the same, they just live in separate directories. Groups are typically used for student organizations such as clubs, intramural sports, Greek Life, etc. whereas Departments are used for Academic Departments, Centers, etc. The common denominator here is that these pages are meant to provide additional information about the hosts of your events. Additionally, all landing pages display Upcoming Events and Recent Events. This is useful to your Users browsing the calendar — if they come to this page and there are no upcoming events, they’ll be able to see the recently held events to get an idea of the kinds of events they can expect from a Place, Group, or Department. If a User is interested in the events on a Landing Page, they can follow the Place, Group, or Department. Once they click follow, they will populate the Followers box and all events assigned to the Landing Page will be added to their plans. Adding an event to your Plans triggers two notifications. One the day before the event as a reminder, and one the day after the event to review their experience. Filters should be broad, audience-centric, and digestible lists that encompass a large variety of events, and you can assign as many Filters to an event that apply! They should be permanent to your calendar. If a Filter is only relevant for part of the year or for a weekend, they’re too specific and will sit empty for the rest of the year, which can have a negative impact on your SEO. Localist has other means of categorizing events on your calendar to avoid temporary Filters. Avoid overlapping Filter Items. Your Users may not know the difference between a lecture, talk, or colloquium. To keep that broad, you can consolidate all those events into the “Lectures & Presentations” Filter Item. Avoid duplicate Filters. If you have “General Public” in the Audience Filter Family, you do not need “General Public” in Event Types. This Filter Item fits best in Target Audience because it outlines who the event is targeted towards. Duplicates can create confusion not only for the User browsing, but also for the User submitting events. If they aren’t sure which one to assign to their event, they may abandon using it all together. The final part of your Classifications are Tags & Keywords. Tags and Keywords are free-text labels that are assigned to events. These are best for temporary or ultra-specific categories – in comparison, Filters are broad and permanent to your platform. 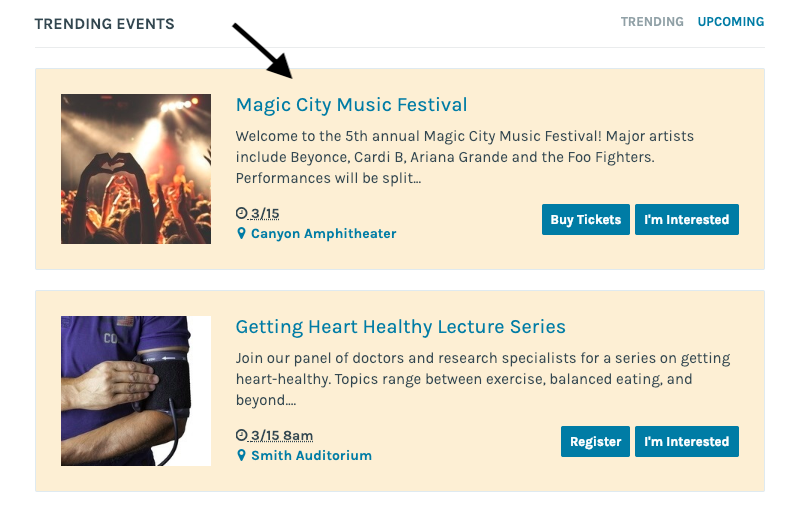 Tags & Keywords can reflect things like a concert series, convention, festival, etc. Functionally they’re the same, they’re just displayed differently. Tags – are seen by the public on the Event Details Page. When you click on a Tag, you’ll be taken to a Search Results Page for all events that have been assigned to that Tag. Keywords – are hidden from the front-facing platform and are only seen by search engines such as Google. They’re great for common misspellings for SEO purposes – for example, if you have a guest lecturer who has a uniquely spelled name, you can type those common misspellings as Keywords on your event. This way, if a User uses the search bar on your platform to type the name of the lecturer, but they spell it incorrectly, they’ll still be able to find the event. Getting Classifications set up FIRST during implementation is important so when you’re ready to add events to your calendar, you’ll know they’ll be properly classified to make them discoverable! Now that you know how to classify your events, let’s talk about how to get those events onto your platform! There are four ways to add events to your platform: In the Admin Dashboard, you can use the Admin Event Form, Bulk-Add Events or Upload Feeds. On the public side, Users can submit their events via the Public Submission Form. Admin Add Event Form– This is accessible by admins only and it has additional fields, such as Tags & Keywords and Visibility options that base-level Users do not have access to. Bulk-add– If you’re looking to add a bunch of events at once, you can use a CSV template. This is a one-time upload of your events and each header matches the fields on your Admin Event Form. Feeds– Localist supports CSV, ICS, and RSS feeds. CSV feeds are preferred since they provide the most amount of event data, followed by ICS, and RSS provides the least amount of event data. Feeds are updated once daily, overnight between about 2am – 5am EST. When adding your feed into Localist, you have the option to assign Content Overrides to ensure your events are properly classified! These are your already set Filters, Groups, Departments, and even a photo that you can assign to every event in the feed. This is helpful if you have a feed of all music events, you can assign the Filter “Arts & Culture” to every event in the feed! The last way to get events on your calendar is via the Public Submission Form (Submit an Event). All logged-in Users have access to the form to submit events to your calendar for approval. On this page, you’re able to add Guidelines Boxes above, within, and to the right of the form. Customers use these to communicate with Users how they should be filling out this form. Also on this form, you can add Custom Fields to gather more information from Users. The Contact Email field is popular with customers because the person who submits the even isn’t necessarily the point of contact for the event. To ensure your Admins know who to contact with any questions about the event, you can also mark Custom Fields are required. Once a user clicks add event from the Public Submission Form, the event goes to the Pending Queue where an Event Admin can approve, reject, or edit events. When an event is rejected, the admin can give a specific reason in the text box. That said, if the event only has minor errors such as spelling mistakes, instead of rejecting the event, Event Admins can click on the name of the event to make edits before pushing it to the live platform. Keep in mind that if an event is rejected, it’s gone forever. That means the User will not be able to click back into the same event to make any changes, they’ll need to start over with a fresh submission. Now that we covered how to classify and add events to your platform, Localist helps you promote those events directly on your platform by Featuring and Sponsoring them! Featuring and Sponsoring events are great ways to give events extra attention on your platform and events can be flagged as both. Featured – events get a prime spot on your calendar homepage or Channel in the Featured Carousel. These are events that appear to be endorsed by your org. The Featured Carousel displays 10 events at a time and you’re able to flag an infinite number of events as Featured. Once one event is over, the next chronological event hops into the carousel. Sponsored – If you’re looking for a softer endorse of an event, you can flag it as Sponsored. Once flagged, the event will be given a boost in Localist’s propagated trending algorithm, and the event will be pushed to the top of Trending list. The event is also given different styling to bring more attention to it. This styling stays the same throughout your platform, and you’re able to use custom CSS to match this styling to your unique brand! Trending – is based on Localist’s propagated algorithm to find not only the most popular, but the most unique and interesting events based on User data. We don’t release the exact details of this algorithm, but things like clicks, amount of time spent on the page, shares, etc. are all taken into account. Trending is always learning — as interests change around the community, the algorithm keeps up with User trends! Having Trending as the default view is an industry standard. Thinking along the lines of how social media such as Twitter or Instagram, and even news outlets such as the New York Times display content, you’ll see information in order of relevance rather than chronological order. Upcoming – a chronological view of events. Let’s switch gears and take a look at the Event Details Page. This is a dedicated page for events that provide your Users with event context — which includes all the Classification assigned to the event. 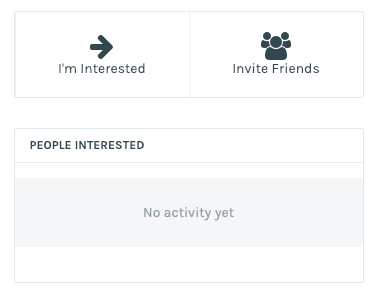 On this page, users can mark themselves as I’m Interested in an event. Similar to following a Place, Group, or Department Page, the User will populate the people interested box plus it will add the event to the User’s plans. This triggers the two notifications — one the day before the event as a reminder, and one the day after the event to review their experience. The community is social, and we found that seeing who is attending an event actually boosts event attendance. Of course, we understand there are events that don’t necessarily require the I’m Interested function such as a candlelit vigil, so you’re able to turn I’m Interested off on a per-event basis. Now that your events are classified and on the calendar, you can start thinking about admin permissions and strategizing a workflow to handle event content on your platform. Localist Permissions are not a hierarchy which means Platform Admins don’t automatically have control over entire platform without all other Permissions checked. User – everyone is a user including admins — this allows everyone to login to interact with your platform. Without this checked, you cannot Submit an Event, mark yourself as I’m Interested, etc. on the calendar. Trusted User – This is a non-admin permission that allows the User to submit events to calendar via the Public Submission Form and skip the pending queue. Keep in mind that this permission doesn’t give the User access to the Admin Dashboard or the additional Admin fields such as Tags, Keywords, or Visibility. Event Admin – If you do want the User to have access to Admin fields, you can make them an Event Admin. They can add, approve, reject, and edit events on your platform. As an admin, they’ll also have access to the Admin Dashboard. Featured/Sponsored – Event Admins have an additional permission to promote events directly on your platform on your homepage or Channel with the Featured/Sponsored permission. Channel Admin – can add & edit Channels in the Admin Dashboard to change the general look and feel of your additional calendars. Group Admin – can add and & edit both Groups and Departments in the Admin Dashboard. Group Officer – is our other non-admin permission. For the Group or Department they’re assigned to, these Users can edit the description, accept follow requests, and send messages to everyone in the Group or Department. They cannot access the Admin Dashboard, so they won’t be able to add additional Groups or Departments to your platform. This is great to give to student leaders, heads of departments, or partners so they have a small slice of your Localist calendar. While they can’t moderate the events assigned to their Group or Department without other permissions checked, they can use this permission to connect with the community that follows their page. Platform Admin – can add users, escalate permissions, add Places, upload feeds, edit global settings, and change the general appearance of platform. Any event that I am adding to your platform must include the Classification to which I’m allowed. If I want to add an event that doesn’t include my Allowed Classification, it will go to the Pending Queue where an Event Admin with the proper permissions can moderate my event. When I go to the Pending Queue, the only events that I will be able to see to moderate will be events that include the Classification that I’m allowed to. When I add an event to your platform, I won’t be able to see or access that Classification Item from any of the dropdowns. I am unable to interact with that Classification item at all on the platform. When I go to the Pending Queue, I am unable to see events that include the Classification to which I’m Excluded. One caveat of this workflow is that if the Classification isn’t included in the event, the Event Admin won’t be able to see the event for moderation in the Pending Queue. To ensure that events that don’t slip between the cracks, we suggest having at least one or two Event Admins Allowed to everything, which would be to leave this section blank. Now that you know how to classify and add events into Localist, you’re ready to start Promoting these events! Localist Promotion tools include Channels and Widgets. These tools use already existing Classifications or Date Ranges to pull events. First up we have Channels. Channels are a Localist Promotion tool that generate a new page on your platform sort of like a “calendar within a calendar”. Channels are a great way to implement brand and layout changes since customization is as simple as dragging and dropping components around the page. You can make your Channel as decked out or toned down as you like. Additionally, your homepage is a Channel so anything you can move around here can be done to your Homepage. Channels are great for pooling short-term events such as festivals, homecoming, graduation, or they can be used for pooling like-events such as athletics, academic calendars, exhibitions, or conferences. Widgets are similar to Channels in that you can pull events into the Widget using already existing Classification or Date Ranges. The main difference between Channels and Widgets is that the Channel actually lives on your calendar platform whereas a Widget is generated to be placed on an external page to direct traffic back to your calendar. Widgets are a great tool to set and forget — add events once in Localist and display them anywhere you like! Out of the box, Localist provides three basic Widget templates and they’re designed to inherit the styles of the page they live on. If you’re looking for a more unique look and feel, you’re able to create custom Widget templates in the Admin Dashboard. Localist allows you to use your organization’s unique branding to create a seamless transition between your website and your new calendar. Having that transition builds trust with your Users — they won’t feel like they left your website! You can accomplish this seamless transition by simply changing the colors and fonts of your platform. This is an out of the box Localist platform with added colors, logos, and fonts. It’s clean, effective, and requires little to no knowledge of CSS and HTML to accomplish. Additionally, Localist is responsive out of the box, so Users on smartphones and tablets will be able to navigate your platform! A SILK Wrapper is your header, footer, and base styles that gives Users that seamless transition from your website to your calendar. You’ll need experience with CSS and HTML in order to get set up with the wrapper. You’ll typically use a basic page on your current website, remove the body content, add Localist comments, and clean up with CSS. The Theme Editor gives you access to your platform’s HTML to customize how data is presented. For instance, you can add guidelines boxes etc. Keep in mind that your Homepage is a Channel, so if you want to move or add components to your Homepage, you can do so in the Homepage Channel Layout Editor in the Admin Dashboard. The last part of your branding is to set your Custom Domain. All platforms are in a subdomain format so you can create a CNAME record to point your Custom Domain to your Localist placeholder URL. Once you know what domain name you’ll be using, let your Implementation Specialist know so they can get a CSR generated to set up SSL for your platform. Once you have access to your platform, start working on your Classification. You’re able to bulk-upload your Places, Groups, and Departments so try to access a list of all Places, Groups, and Departments for your organization. To get started, for Places all you need is a name + address and for Groups/Departments you’ll only need a name. The other information such as a description or photo can be added later! If there are any additional Filters that your Users will be expecting, you can add them. In parallel with your Classification, start working on Branding.